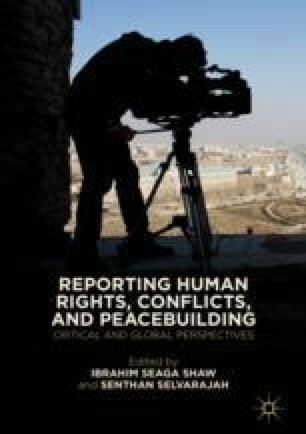 A shortfall in the theory of Human Rights Journalism (HRJ) conceptualised by Shaw in 2012 is its lack of epistemological explanation to understand its feasibility, exercise and power. In this chapter, Shaw and Selvarajah seek to fill this scholarly lacuna and contribute to the advancement of the theory of HRJ. They argue that if ‘truth’ is the highest goal for a journalist, the practice of HRJ, as a ‘rights based’ approach is viable and effective within the critical constructivist epistemology, which allows a journalist’s intellect to be the guide to understand the issues and uncover the truth through a diagnostic process. This chapter attempts to trace the power of HRJ as a ‘rights-based approach’ to promote and protect human rights in times of crisis, drawing insights from Foucault’s notion of regimes of truth. Robinson, P. (2013, September 17). Media as a Driving Force in International Politics: The CNN Effect and Related Debates. E-International Relations. Retrieved December 8, 2017, from http://www.e-ir.info/2013/09/17/media-as-a-driving-force-in-international-politics-the-cnn-effect-and-related-debates/.